Friends, it was lovely and packed with memories I will not soon forget. And in a time where memories are made every day the fact that my smile is still plastered across my face, and probably making everyone think I am making fun of them in the deep recesses of my mind, says a lot. I am still overflowing with joy from everywhere God’s glory exploded bright yesterday. I kind of feel like when Moses’ face kept reflecting the glory of God after being in his presence and no one could look at him when he carried the Ten Commandments down from Mt. Sinai. They were afraid to approach him because his face shone from talking to God. But it isn’t creepy. It isn’t scary. It is holy. Oh, friends, that this joy would continually be reflected out of Haitian lives. 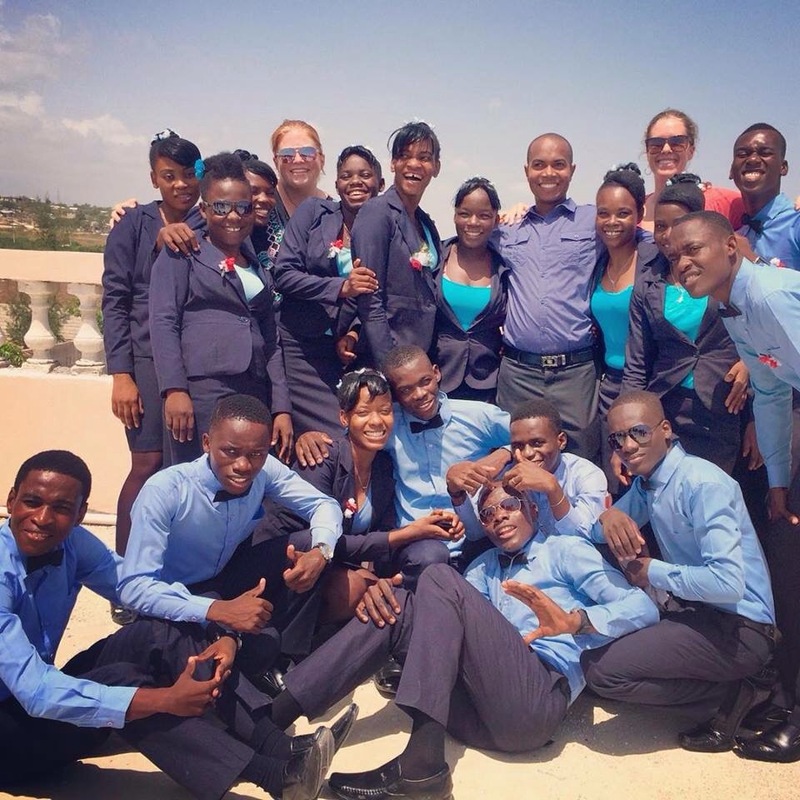 Yesterday marked the first graduating class of the Pathways program through Global Orphan Project in Haiti. Two years of hard work for students who have not passed school grades anywhere from 4th to 10th grade in Haiti and had to leave a Pastor’s care at age 18. Two years of living as a community. Two years of budgeting, language and life learning. Two years of true friendship and maturing. Two years of discipleship and growth as local church leaders. Two years of learning trade skills to earn a job within a country that has an unemployment rate of 70%. Two well fought years to reach yesterday. I’ve seen grief in these students. I’ve seen their confidence grow. I’ve seen passionate prayer and worship. I’ve seen struggles. I’ve seen them walk with kindness and respect for others as they learn to navigate life beyond a Pastor’s care. I’ve seen them empowered and proud of themselves as they gain job skills and feel they have something to impart on younger students. I’ve seen them investing in other young lives still living in a Pastor’s care. As I reflect on yesterday while I journey to Kansas City for my brother’s celebrations leading him into a new married life…I am breathing deep breathes of gratitude. Today I am praising true life, because it is a gift to live and count so, so many people as dear friends across so many different cultures and languages. Today I am grateful for patience in Haitian culture, because through the craziness of traffic and no disgust in long lines, Haiti has taught me to slow down and treasure what is in front of me…to take the moments we are given for what they are meant to be. I am inspired while living within a culture that lives the example of respectfully greeting colleagues and friends when you first see them in the day with a hand shake and kiss to the cheek. It is intentional. It is meaningful. It shows they are present with you and we are known by one another. Today I am thankful for the examples of overflowing love of Jesus in the Haitian lives surrounding me, because it has taught me to not be ashamed of who I follow and easily sigh with ‘Seigneur Jésus.’ It has taught me that worship is passionate, with your whole existence crying out for the Savior. Today I smile with overflowing love for a culture of extremes and being chosen to grow within this place. It is not easy living within the extremes of Haiti. This place is no where near perfect, but there is loads of beauty…even in dirt and trash. There are many things that ignite my sense of justice and many things that force me to rely on faith when I do not understand. But they hone my vision to God’s Kingdom restored and renewed, and fuel my fight for that Kingdom to be known. Today I am refreshed by young lives filled with pride and confidence through empowerment. As I sit and soak in the last year and a half, and look forward to the next year in Haiti, I see it as the incredible gift it is in my life. I am grateful for my calling, and this time of being placed perfectly within who God created me to be for his Kingdom. God’s glory is evident and present everywhere, but somehow Haiti purifies it and allows us to look through a clear lens. I will forever crave the presence of the Holy Spirit in this place and Haiti will forever make my heart explode. This entry was posted in Haiti and tagged GO Project, God, Holy Spirit, Jesus, joy, Pathways. Bookmark the permalink. Awesome! And I especially love the group photo. So um. Which one is you? Lol.